Yesterday’s post with Sean’s graphs has been updated, to show a thaw index closer to last year’s actual result instead of last year’s forecast. Also the graphs have titles now. You may need to hit refresh to see the changes. Now six pictures from around 10:00 this morning. I’ll start with the Winnipeg River, because we were arriving from the north. This is looking west at the Big Straight, with Minaki at the right hand edge of the picture. Although the river has quite a lot of open water, the lakes are a different story. You can click on any of these pictures to see them full-screen, and click on that larger image to zoom to the full resolution. A little closer to town, around Dufresne Island, facing south west. Downtown Kenora is at the left, Keewatin is above the centre of the frame, with Darlington Bay extending to the right. Here’s a nice shot of the whole Kenora harbourfront. Kenora Bay and the LOW hospital campus are at the lower left. Keewatin is at the right. If you drive over the Keewatin Bridge, you see a lot of open water, but there’s ice out by Yacht Club Island. Coney Island is still surrounded by ice and Rat Portage Bay is pretty solid. This next picture shows the condition of the lake as a whole: white ice as far as the eye can see. Zoom in to look at the open water in The Tangle. Left of centre, you can see the ice does look a little discoloured out between Town Island and Scotty Island now. Lastly, a look at Pine Portage Bay, Long Point and Longbow Lake. Sorry, but there’s no sign of any melting in this area. I talked to someone that went ice fishing in the Storm Bay last weekend. They said there was still three feet of solid ice, with only an inch or two of softer refrozen slush on top. This is why I’ve been pointing my camera at the river and harbourfront; there’s not much going on anywhere else. When I get a chance, I’ll try to swing by Sioux Narrows and the Barrier Islands because satellite imagery suggests there’s some water showing there, but that’s a fairly significant detour, so I’m saving that for when there’s more to see. Satellite images were good today, especially the ones from Terra. Links updated. On Friday we came home during a spell of poor weather, and although we caught glimpses of the lake between the clouds and flurries, trying to take photographs would have been pointless. But today the weather cleared right up in time for the Aqua and Terra satellites to get fairly good pictures. The large red ellipse at the top includes not only the southern portions of the Winnipeg River, but also, at the bottom of the ring, a recently enlarged area of water around Channel Island or perhaps The Tangle. The middle ring is Big Narrows, and it looks like there may have been some expansion of the open water there. The ring at the bottom shows water pushing into Lake of the Woods from the mouth of the Rainy River. That’s new. It first showed up a few days ago. Here’s a photograph from a week ago, for comparison. There’s more good news. We might finally have reached the point where we spend more time above freezing than below. The next few days look promising, with forecast highs of 5º to 8ºC and overnight lows of 0º to -3ºC. For almost a month now, weather forecasts have been saying warmer weather is just a week away. It still says that, and to be clear, they’re not talking about above normal temperatures. But it looks as if we might see a gradual improvement towards seasonal norms. That would be daytime highs of 10ºC, and overnight lows of about -1ºC. Let’s hope it doesn’t slip away this time. 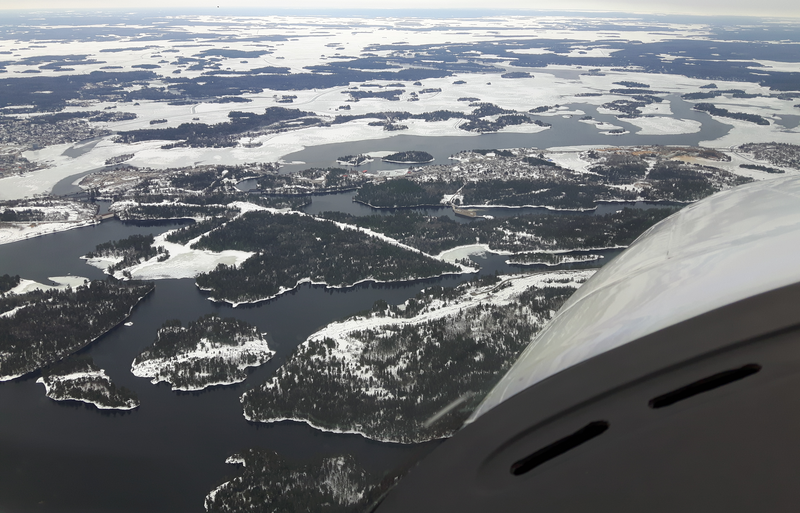 The weather here in Kenora was good enough to go flying yesterday, but weather in the places we wanted to go was bad, with fog and freezing drizzle. Even if we had taken off, the cloud was too low for taking photographs. Today we woke up to cold weather and little snow flurries. As I write this, in the late afternoon, the temperature has not risen above -4ºC. Worse, although we will see thawing daytime temperatures in the coming days, overnight lows are expected to remain cold for the rest of the week. I heard from my friend Sean, who graphs the mean daily temperatures with an eye to making informed predictions, and he’s not sure we’ve reached the inflection point yet. That’s the date when our mean daily temperature rises above freezing on a lasting basis. It was looking like we might have managed this a few days ago, but if we have a run of cold days, the lasting part won’t hold up and we’ll have to wait a little longer. Now, on to some fresh pictures. These are not in the order I took them, but we can start with the Norman to Keewatin waterfront. This is looking south over the lake, with Keewatin’s iconic bridge at the right in the middle distance. Remember, you can click on any of these images to see them full-screen, and click on that larger picture to see them at maximum resolution. 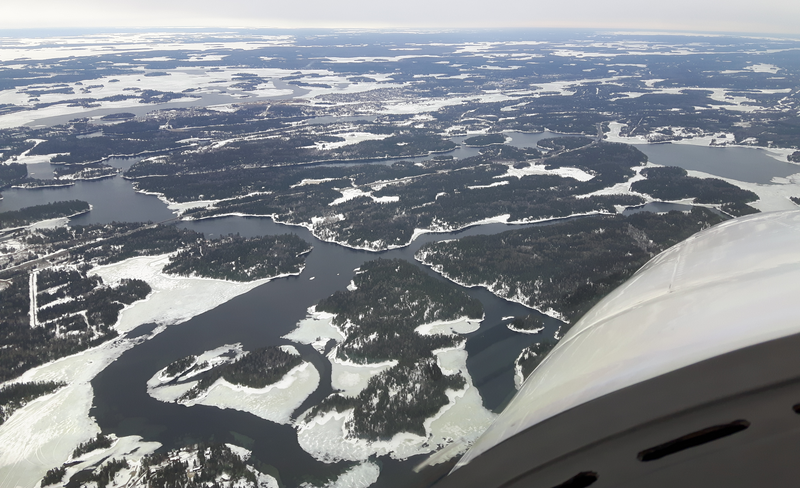 What you might want to zoom in on here is the water beyond the bridge, where the weekend rain has weakened the ice between Safety Bay and Keewatin Channel. The water in the foreground is Palmerston Channel, I believe. Darlington bay is almost hidden because the clouds kept us rather low today, obliging us to take pictures at a low angle. Let’s look at the Winnipeg River next. This picture is centred on Laurenson’s Island, and looks roughly west with Locke Bay stretching away off to the left. There’s lots of open water in the main channel, but last nights sprinkling of snow has covered the ice in the quieter bays, making it hard to assess the quality of ice there. Further north, this is what things look like at the Little Dalles. This picture looks north. Way off on the horizon, you can see Big Sand lake. To finish, a couple of shots from further south on the lake. First, the Barrier Islands. A snow flurry blurred this picture, but this is the state of the open water around The Elbow. We’re facing west. Allie Island is on the left of centre*, Mather Island to the right. Bald Island is at the bottom left, and part of Queer Island is at the lower right corner. Most of the dark patches here are just cloud shadows, but the two bluer ones are water. *I’ve set my spell-checker to Canadian English. This last picture is of Whitefish Narrows. Yellow Girl Bay dominates the foreground, Long Bay spans the middle, and beyond that you can see a little water at Whitefish Narrows slightly to the right of centre. Again, a layer of fresh snow makes it hard to judge the ice. As for the fourteen day forecast, it looks as if we have at least another few days of disappointing temperatures. A normal high this time of year is about 9ºC (and rising steadily), but I see nothing warmer than 7ºC coming our way in the next two weeks. Overnight lows could run at or slightly above normal, but the daytime highs don’t look encouraging. I’m not scheduled to fly tomorrow, so I might take a look at my archived pictures from previous years to see how this spring compares to better and worse thaws. I got home slightly earlier today. With the sun low in the western sky, I still couldn’t get good pictures of the Winnipeg River, but I can summarize what I saw: near Minaki, there are patches of open water, while the Big Straight is still frozen where it is wide with a more sluggish current. From the Dalles through to the headwaters on Lake of the Woods, there’s a lot of open water where the current is strong in the main channel. Quieter bays are still frozen. And now, on to what I could get clear pictures of. Looking south west over Kenora with the headwaters of the Winnipeg River in the foreground. Downtown Kenora and Kenora Bay are at the left of the picture, and Safety Bay is near the center of the frame. The bad news: recent snow flurries have restored a beautiful white layer of reflective snow on the ice. The better news: open water on Keewatin Channel is expanding towards Safety Bay. Here’s a slightly closer look at the Keewatin Channel and Devil’s Gap areas. In this picture, Kenora’s downtown Whitecap Pavilion is at the bottom of the photo, peeking above the dashboard. The east end of Coney Island is in the middle of the picture, and Keewatin Channel is visible in the distance at the upper right. Zoom in there to see the area where the current is expanding the channel waters towards those at the Keewatin Bridge. There’s little progress at Devil’s Gap. Remember, you can click on these pictures to see them full-screen, and if you then click on that larger picture, it should zoom to a much higher resolution. Yesterday, I couldn’t see Pine Portage Bay or Longbow Lake because a big snow flurry obscured them. Here’s a picture of how they look following that snowfall. I’m afraid it looks more like January than April. This fresh snow cover is not working in our favour, which brings me to the topic of the forecast. For some weeks now, the forecast has been along the lines of: “we just have a few more cold days, and then things are going to warm up.” And then the warming trend seems to get postponed for a few more days. My mother used to say, “Jam tomorrow, and jam yesterday, but never jam today.” This was a (Welsh?) folk saying that means that although you’ve had it before, and will one day have it again, the hope of having a luxury now are likely to be disappointed. I am reminded of this because the abnormally warm weather I eagerly anticipated for this spring seems to keep receding. Don’t be too discouraged. One thing that makes the fourteen day forecast at the Weather Network look as if it’s being revised downward is that normal temperatures go up in the spring. So although we don’t see temperatures rocketing above normal, it is getting slowly warmer. Spring is coming, even if it’s not arriving with a bang. A few days ago, they were showing a seasonal average range as a daytime high of 4ºC, with an overnight low of -6ºC. In other words, it’s pretty typical to have daily mean temperatures of just about freezing at the end of March. Now that we’re into April, they show a normal high as being 6ºC and the low at -4ºC, representing a subtle shift to more of the day being above freezing. However, a sudden switch to unusually warm weather has not happened, and I don’t see it coming in the latest round of fourteen and sixteen day forecasts. What we might get is rain tomorrow and a warm weekend. That would help. I came home early today because of heavy snow up north. That allowed me to take a few pictures at 10:30 this morning. This is the area just north of the Kenora Bypass, looking south west over Norman and Keewatin. In the middle distance, you can trace the Kenora Bypass as it crosses Dufresne Island. Close to the nose of the plane is Sweeney Channel, and on the far side of Dufresne is Palmerston Channel. Lots of open water here, and I wish my flight path had taken me closer to Minaki for a better look at more of the Winnipeg River. I took this picture to show how things are going on Safety Bay, but the photograph is centred on Tunnel Island. If you’re a regular on the hiking trails there, as I am, you’ll be able to spot the railway bridge, the pond on the Sandy Nook trail, the Norman Dam, and other landmarks. If you like to hike a little, I recommend these trails, but they are in rough condition right now, due to deep snow and ice. Maybe hold off until the ticks are out. Ahem. Anyway, There’s not much change along the harbourfront. This last shot is really just a closer look at the same thing, but it shows Devil’s Gap and Keewatin Channel a bit better, if you zoom in. We’ve come to the end of March, and so far there’s been no sign of the warm spring that was in the long-term seasonal outlook. Temperatures this month stayed mostly at or below normal, with only one or two nicer days. A normal high this time of year is around 4ºC, and a typical overnight low would be about -6ºC. The two-week forecast doesn’t show us getting that warm for another week. That means we won’t reach the inflection point, when we start spending more time above freezing than below, (more precisely, when the daily mean temperature is above freezing) until the weekend of April 6th and 7th. That’s about two weeks later than I expected. After that, we might see some slightly warmer than normal temperatures. Nothing in the double digits, though. 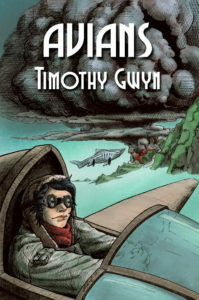 In the meantime, it’s snowing as I write this. The bad weather I encountered up north this morning has reached Kenora. While the forecast called for light snow tapering off to flurries this afternoon, I see that the aviation weather is reporting the visibility as 3/4 of a mile, which is officially considered moderate snow, not light. In more casual terms, I’d say it’s coming down pretty hard. Sad to say, that’s going to restore a lot of our ice cover to a nice bright, reflective white layer. Not helping. Tomorrow is Satellite Saturday on Lake of the Woods Ice Patrol. I doubt we’ll have a satellite shot from today—it’s too cloudy—but we can look back over the week and see what changed. I’ll also use the archives to compare this spring to some recent years, to show how things seem to be shaping up. If you’re a regular here, you know that I take my pictures where the ice is melting. There’s no point taking pictures far out on the lake, it’s all unbroken ice at present. Where the water is opening up right now is the Winnipeg River and it’s headwaters near downtown Kenora. So let’s take a little cruise from Minaki to Kenora. Remember, you can click on any of these pictures to see them full-screen, and click on that larger version to zoom them to full resolution. This first picture shows the south end of Sand Lake, with Minaki above and left of center. The lake behind it that looks like a fried egg is Gun Lake. Anyway, there’s some slush visible, but not much in the way of water. Next up, the Big Straight. Mostly slushy conditions in the Big Straight, a few modest patches of water. The Dalles is always early to open up. Like Safety Bay in Kenora, it has a strong current. These two sites are where water bomber pilots come to do their spring training. Still looking south as we approach Dufresne Island. Then the area around the Kenora Bypass. Quite a lot of open water in this area. Keewatin’s iconic bridge and the water reaching out from Safety Bay towards the Yacht Club. It’s not hooked up to the water in Keewatin Channel yet, but that will be a milestone in the next week or so. A quick shot out the side window (looking west) to take in Darlington Bay. That big building near the bottom of the picture is the Keewatin Rec Center. A closer look at the Keewatin Channel. Not much change to the amount of open water, but I think the slush zone has expanded. This looks east over Golf Course Bay. 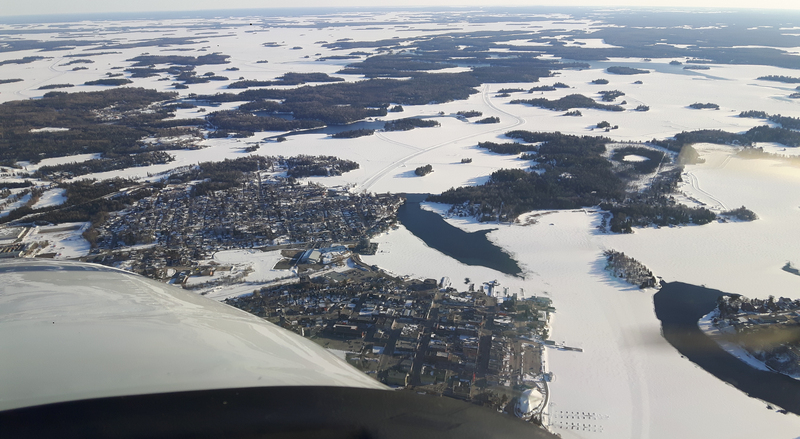 You can see the Kenora airport at the upper left corner because we’re lining up to land. I took this one to show that open water is expanding south (upcurrent) from Devil’s Gap past Treaty Point. I’ve updated the satellite picture links. 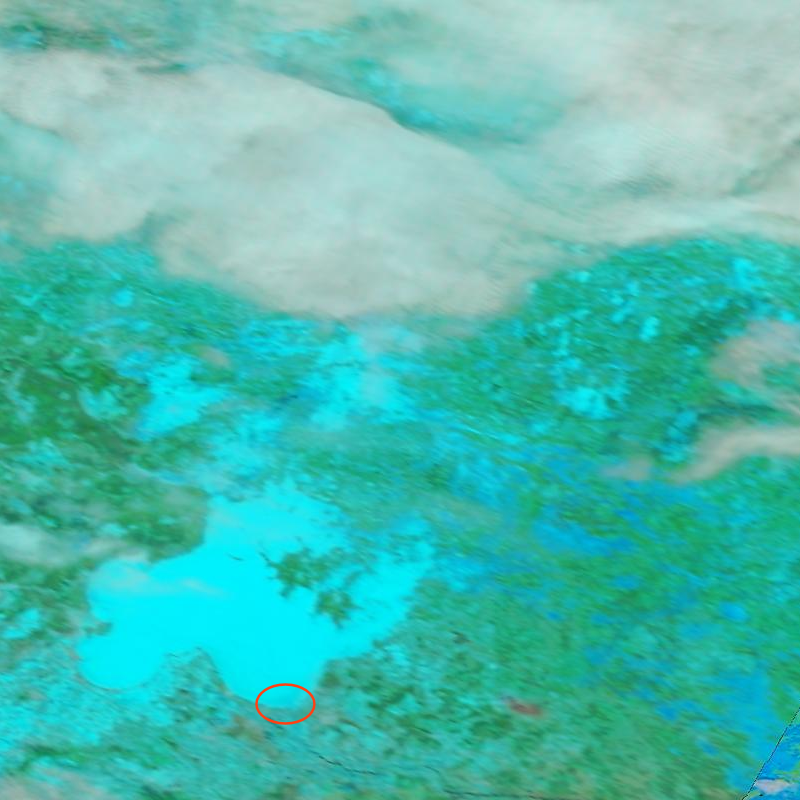 On today’s False Colour image from the Aqua satellite, you can see some stretches of open water on the Winnipeg River. It shows as black against the bright blue ice, and it corresponds well to what I saw from the plane today. There are patches of water as far north as Whitedog. My next flight should be on Wednesday, a day that’s forecast (for now, anyway) to be warm with a chance of showers. Rain showers don’t make for good photography, but they’re great for removing snow cover. We’ll see. 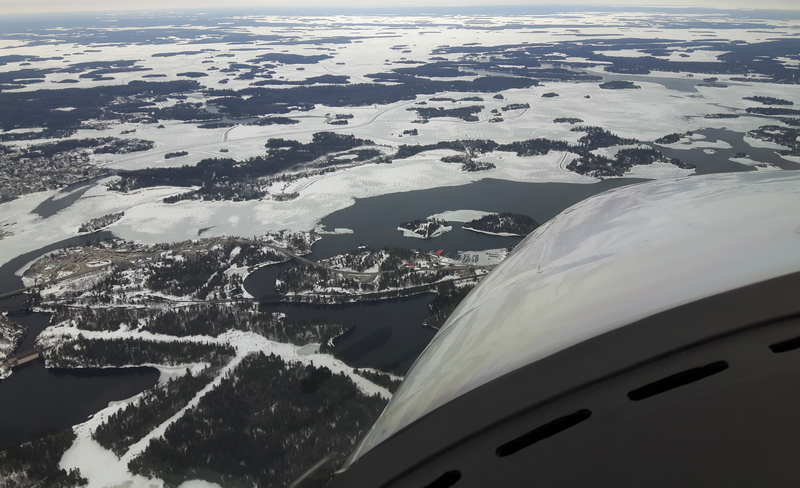 John Sweeney and Andy Zabloski flew today and returned from the north in the afternoon, so they helped me out with some pictures of the Minaki area. Big Sand Lake, north of Minaki. Wind has driven the last of the ice to the shore. You can click on any of these pictures to see a high-resolution, zoomable version. The south end of Big Sand Lake and all of Sand Lake, with Minaki visible near the left side. Sand Lake, with Minaki closer to the center of the picture. That white streak near the horizon is ice on Shoal Lake. Winnipeg River, with Kenora in the distance, above the center of the photograph. The narrow lake near the top left corner is Lower Black Sturgeon, and the white patch at the top right corner is ice on the south part of Lake of the Woods. In other news, the footbridge to Coney Island came out this morning. That’s scheduled when the waterway from downtown Kenora is otherwise open all the way to Devil’s Gap. A quick glance at the start of my own flight at twilight revealed that there are some boats in the water at Northern Harbour. We didn’t look at more distant parts of the lake, because there wasn’t enough light to distinguish ice from water. Satellite images from the last two days have not been good. 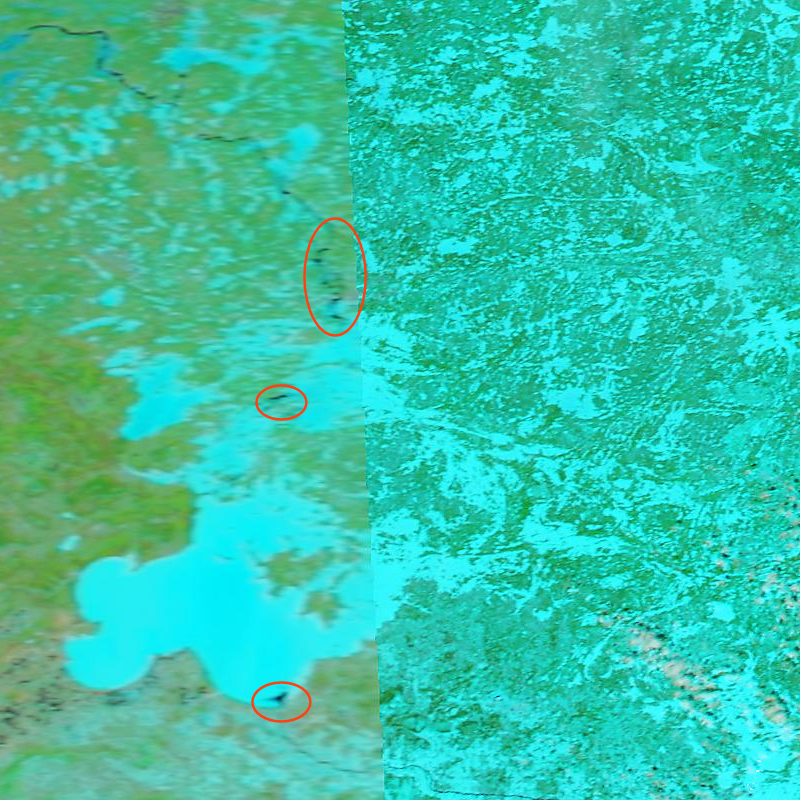 I’d like to see what’s going on with ice on the southern parts of Lake of the Woods, but cameras on both Aqua and Terra satellites have been thwarted by cloud cover. Some parts of the lake can be glimpsed through gaps in the cloud, and do show the ice darkening, but we haven’t had a really clear image since May 7th. Tomorrow I’m scheduled for a training flight, so I hope to get a better look around.